Taller than even my father, / with what Mami has always said / was “a little too much body for such a young girl.” / I am the baby fat that settled into D-cups and swinging hips / so that the boys who called me a whale in middle school / now ask me to send them pictures of me in a thong. Her parents forbid her to interact with boys even though the boys whistle at her and try to talk to her on the street, and one boy in particular, the kind, music-loving Aman is paired with her in biology class. And her mother makes her attend confirmation class every Tuesday afternoon, which conflicts with the poetry club her favorite teacher, Ms. Galiano, has started. Running throughout this story of coming of age, first romance, and discovering a beloved brother’s deepest secret, is the central theme of a young woman coming of age, coming to terms with her sexuality, and finding her voice. For Xiomara, who chooses to perform her slam poetry under the name “The Poet X,” free verse is the freedom to be herself, to say what she wants, to make her choices, and to come to terms with her own version of faith. 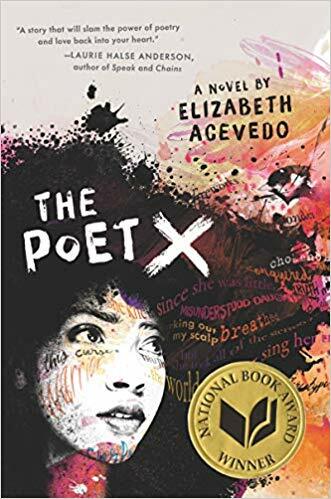 The Poet X is highly recommended.